Definition: The tunnel diode is a highly conductive, heavily doped PN-junction diode in which the current induces because of the tunnelling. 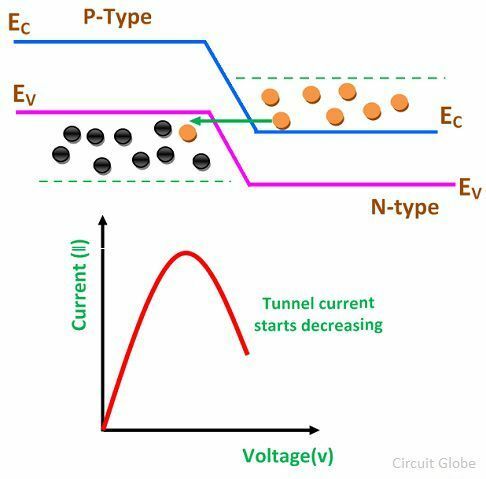 The tunnelling is the phenomenon of conduction in the semiconductor material in which the charge carrier punches the barrier instead of climbing through it. The tunnel diode is a heavily doped PN-junction diode. The concentration of impurity in the normal PN-junction diode is about 1 part in 108. And in the tunnel diode, the concentration of the impurity is about 1 part in 103. Because of the heavy doping, the diode conducts current both in the forward as well as in the reverse direction. It is a fast switching device; thereby it is used in high-frequency oscillators, computers and amplifiers. 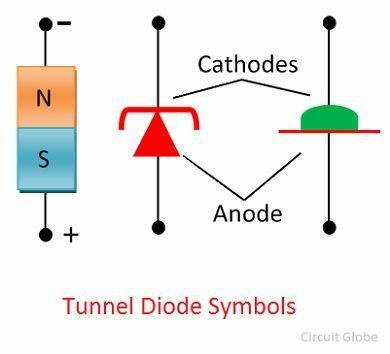 The symbol of tunnel diode is shown in the figure below. The cathode and anode are the two terminals of semiconductor material. The p-type material attracts the electrons and hence it is called anode while the n-type material emits the electrons and it is named as the cathode. The device is constructed by using the two terminals namely anode and cathode. 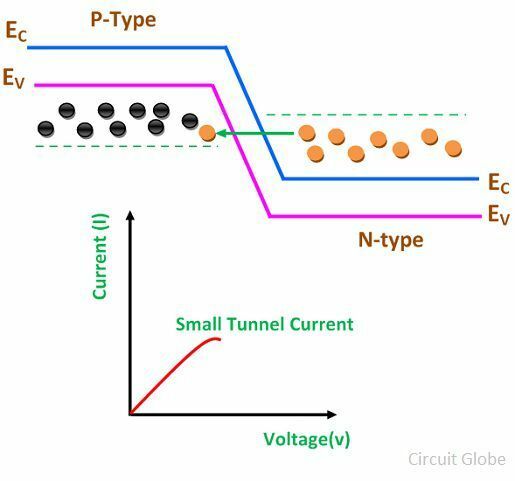 The p-type semiconductor acts as an anode, and the n-type semiconductor material acts as a cathode. The gallium arsenide, germanium and gallium antimonide are used for manufacturing the tunnel diode. The ratio of the peak value of the forward current to the value of the valley current is maximum in case of germanium and less in silicon. Hence silicon is not used for fabricating the tunnel diode. The doping density of the tunnel diode is 1000 times higher than that of the ordinary diode. In forward biasing, the immediate conduction occurs in the diode because of their heavy doping. The current in a diode reached their maximum value IP when the Vp voltage applied across it. When further the voltage increases, the current across the terminal decreases. And it decreases until it reaches their minimum value. This minimum value of current is called the valley current Iv. The graph above shows that from point A to point B the value of current decreases with the increase of voltage. So, from A to B, the graph shows the negative resistance region of the tunnel diode. This region shows the most important property of the diode. Here in this region, the tunnel diode produces the power instead of absorbing it. 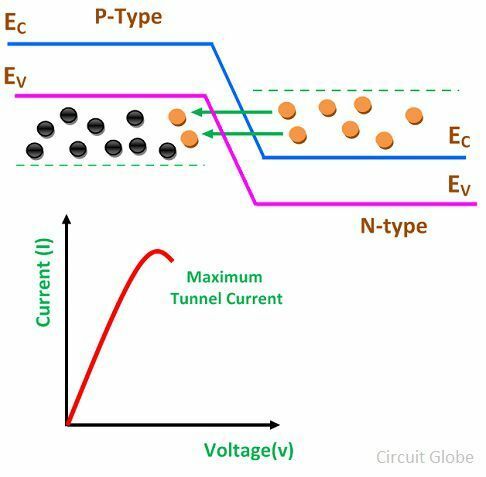 When the tunnel diode is unbiased, or we can say when no voltage is applied across the diode in that case the conduction band of the n-type semiconductor material overlaps with the valence band of the p-type material. This happens because of the heavy doping. The energy levels of the hole and the electron in the p and n-side respectively remains same. When the temperature rises, the electrons tunnel from the conduction band of the n-region to the valence band of the p-region. Similarly, the hole, tunnel from the valence band of the p-region to the conduction band of n-region. The zero current flows through the diode in the unbiased condition. When the small voltage is applied across the tunnel diode whose magnitude is less than built-in-depletion region voltage, then no electrons cross the depletion region and zero current flows through the diode. The few electrons from n-region of the conduction band are tunnelled into the p-region of the valence band. Because of the tunnelling of electrons, the small forward current flows through the depletion region. When the heavy voltage applied across the tunnel diode, the number of electrons and holes are generated. The increase in voltage increases the overlapping of conduction and valence band. The energy levels of the n-side valence band and the p-side conduction band is equal. Thus, the maximum current flows through the tunnel. When the applied voltage is further increased then the valence and conduction band of the diode is slightly misaligned. But the conduction band of the n-type region and the valence band of the p-type region still overlap. 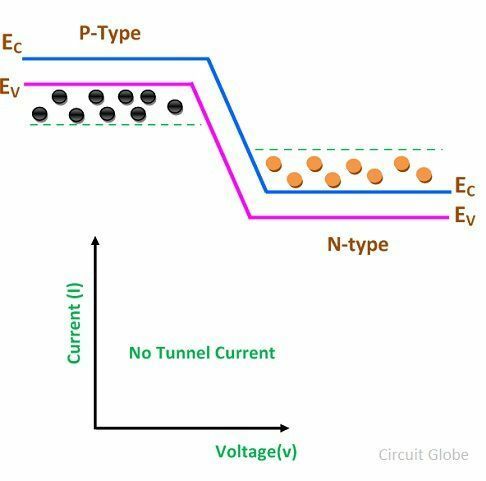 The small current flows through the diode, and thus the tunnel current starts decreasing. If the voltage across the conductor is heavily increasing, the tunnel current drops down to zero. In this condition, the conduction band of the n-side and valence band of P-side are not overlapping each other, and the diode behaves like an ordinary PN-junction diode. If the magnitude of the voltage is larger than the built-in voltage, the forward current flows through the diode. What is negative Resistance in Tunnel Didoe? It is shown above in the graph that between the point Iv and Ip the current starts decreasing when the voltage is applied to it. This region of the graph is known as the negative resistance region. 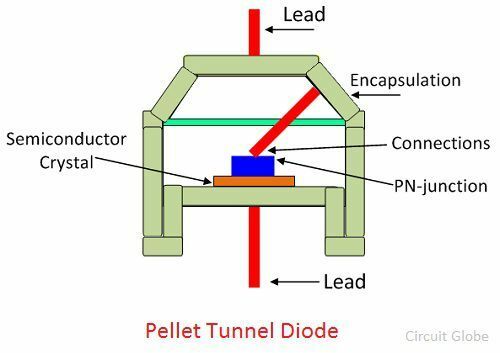 It is the most important characteristic of the tunnel diode. In this region, the tunnel diode generates the power instead of absorbing it. The equivalent circuit of the tunnel diode is expressed in the figure below. The Rs represents the resistance of the connecting leads of the diode and the semiconductor material. It is approximately equal to the 5Ω. The Ls is the inductance of the connecting leads, and it is nearly equal to the 0.5nH. The Cd is the junction diffusion capacitance, and their magnitude lies between 5 to 100pF. The tunnel diode has low cost. It produces low noise, and their fabrication is also very simple. The diode gives a fast response, and it is moderate in operation. The tunnel diode works on low power. 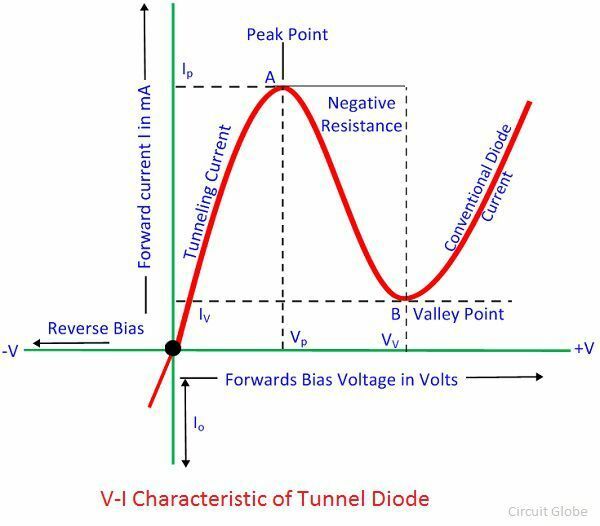 The disadvantage of the tunnel diode is that output voltage of the diode swings. It is a two terminal device, but their input and output circuits are not isolated from each other. The tunnel diode can be used as an amplifier and as an oscillator for detecting small high-frequency or as a switch. It is a high-frequency component because it gives the very fast responses to the inputs. The tunnel diode is not widely used because it is a low current device.